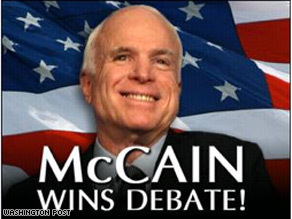 The McCain campaign released a web ad Friday claiming McCain won the debate. (CNN) - The time between the final answer in any presidential debate and the campaign press release declaring victory can usually best be measured in milliseconds. But John McCain’s campaign – which has been downplaying his performance at Friday’s faceoff, offering praise for opponent Barack Obama’s “eloquence” and debating skill – seems to have decided it’s never too soon to start spinning the outcome. The Washington Post reported Friday that the campaign was running an online ad featuring the headline: "McCain Wins Debate!" and a photo of a smiling McCain and an American flag background. Another featured a quote from McCain campaign manager Rick Davis: "McCain won the debate - hands down." The Obama campaign quickly circulated the report – which came moments before McCain’s team confirmed he would take part in the evening debate after all. Maverick behavior! I have been screwing up at work all week and I just look my supervisor in the eye and say, "Maverick behavior!" and all is forgiven. He's probably going to release an ad tomorrow claiming he won the election. The debate he is having with himselt to debate or not! Did he win the one he had with himself? who knows. If this weren't so pathetic, it would be laughable. I thought Walter Mondale and Bob Dole ran terrible campaigns, but this is the most poorly run campaign in my half century of living. It's almost as if these people really don't want to win! First he wants to cancel the debate now he wins something that hasnt even happen WOW i think mccain and his campaign have gone INSANE!! THIS IS FRIGHTENING!! I predict John McCain will go after Obama with personal attacks. Nothing from him will be focused on any issues. He will work to put Obama on the defensive and try to goat him into saying something his campaign will run with. I just hope Obama is very carefull and takes nothing for granted. I don't think McCain is the smartest moose, but I think this is all part of a plan. No presidential campaign can be this reckless. You have NO respect for voters, do u?????? I'm giving my vote to Obama...we need sanity in the oval office. Is it me or does McCain have a very creepy grin? Uhm??? A little cocky aren't we-considering he wanted to postpone both Prez & VP debates just YESTERDAY!!! Oh Well...stupid is as stupid does "sigh"
I TOTALLY AGREE, Palin not only in not ready to be at the white house, she will defenitely represent a danger to our great country. she should go home, take care of her retarded kid, and advise her daughter to buy underware that stays in place when somebody is trying to push them down. Palin can take care of her own family, and she is now trying to decide for ours? That is so disturbing. As a Democrat, i say leave her in the ticket, that makes it easier for OBAMA to win, as an American, I say go back to shooting moose, that is where you beong. The woman was great attacking candidates when reading from a telepromter, but when it comes to real life, and she has to use her brains to answer the questions We all Americans need to have anwered, not only she has no clue, but she looks stupid. She makes Bush look brilliant, and We already know how embarrasing is that lame president . If God decides to punish us and put Mcsame and Palin in the white house, America will contniue to go dwn the hil, and idiots like Iran's president will be laughing at us because they will say We told you so. Wow! You see Palin's interviews and then this. This ticket has lost all its marbles, all of them! What the heck are they doing in the McCain campaign? I guess they are really banking on Americans being gullable and stupid. That is what we would have to be to vote for this train wreck of a ticket. Whew! Some republicans running for re-election in some states are trying to have their name on the ballot WITHOUT A PARTY AFFILIATION behind their name. They are hoping they will get more votes if no one knows they are republican. Doesn't that say it all!! Maybe that is what John McCain should do!! Only John McCain would put out a victory ad before the debate has even happened. But don't worry, they will have some explanation for doing it. Maybe Sarah did it!! Republicans are good at finger pointing. This is too funny! McShame was caught on national televison walking to th congressional meeting , when the meeting was moved, and we he finally found where the meeing was, they were done. How funny is that! Wow I am just speachless now. I don't know what any body can say about this guy. And poor Sarah This is an example of how white people in particular all over this country have been put in powerful positions and are bound for failure. No wonder we are in the mess we are in now. I have a college degree and my supervisor has a GED.